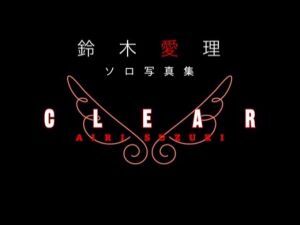 The making of CLEAR is fun to watch,Airi seems to enjoy the photo shoot so much. She smiles a lot, talks a lot and plays a lot. I can’t remember how many times I said “Kawai” in front of my monitor. After the opening title, Airi showed us her photo shoot location from the balcon and said that she is going to do her best in the photo shoot, “KAWAIII”(*^o^*). A really nice smile!! But she definitely love hamburgers^_^. She chat with the camera many times and giggling with them. She just wouldn’t stop untill the end of the making. After about 9 and a half minutes. It finally comes to an end, sadT_T. But, we can just do some playback and watch it all over again, I did^_^ and never get tired of it. At least not right now lol. What do you know…It becomes one of my favorite PB making too. She is definitely a star:). Just got this photobook of Airi today. I’m glad this one is better than the last PB.Here’s some of my favourite scans from the PB, a really beautiful smile and what a nice body she has. Airi looks more mature in some way, But I just wondered if it’s okay for anyone to see a 13 years old girl being exposed like this. The photos are nice, but I think some of the pose that she did is too “mature” for her. Not that I don’t like it:p.
In anyway, I really enjoy seeing this PB as Airi is one of my favorite Hello Project member. This PB had just become one of my favorite of all time. Takahashi Ai latest photobook, was shot in Bali. I like Takahashi Ai better in her new look, very refreshing and seeing her in an Indonesian environments in the background is very nice actually. Although there are some disturbing one, like the “extra joss” table or “warung jawa” as part of the photo, very funny in some way^_^. Download it here, if you want to see what it’s like!